Food And Beverage Nostalgia Trip. 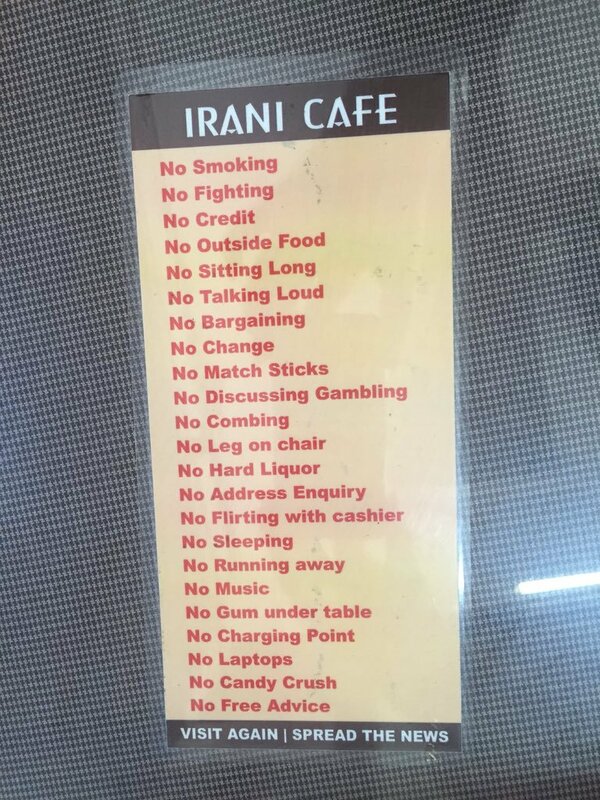 Irani Cafes in some cities of India are legends. 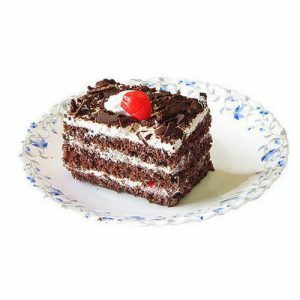 My first exposure to one was in Hyderabad way back in 1958 to a still running one called The Bombay Bakery on Abid Road. I met my brothers in law and some other very dear friends there. It was a place for salesmen to meet for tea before embarking on daily rounds and for bachelors staying alone like me to have breakfast too. 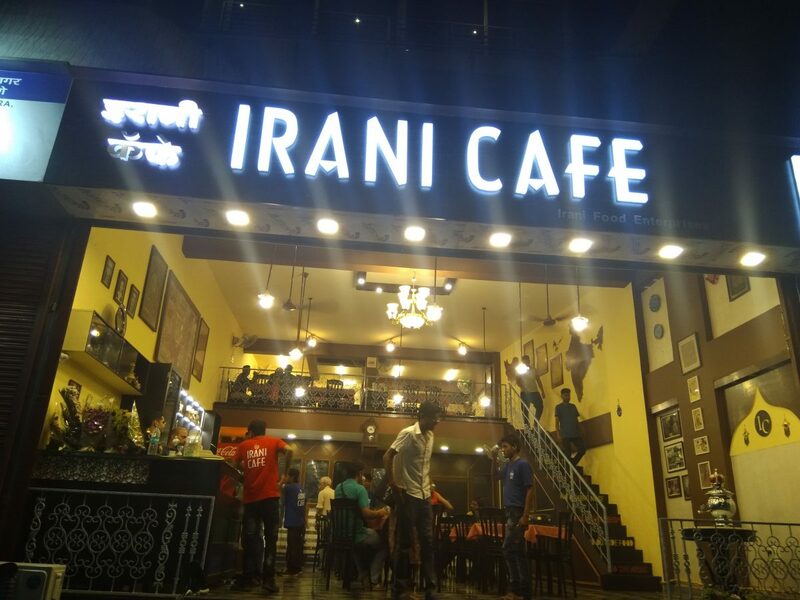 Subsequently, I have been to many Irani Cafes in Mumbai and some in Pune too and the last visit to one was some two decades ago in Pune to one called Good Luck Cafe. 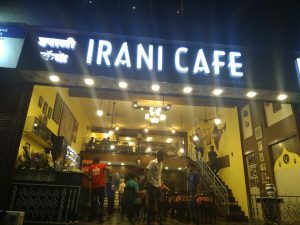 So, when a restaurant called Irani Cafe which already functions at another suburb close to ours, opened a branch just 100 Mts away from my home, I was quite thrilled and looked forward to visiting it many times. 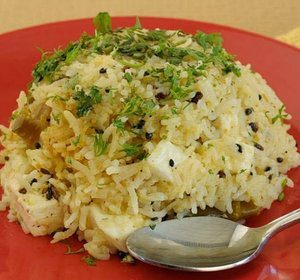 Ranjan and Manjiree, being the foodies and dinner eaters, whereas I am not, had already been there for dinner on two occasions and were full of praise. 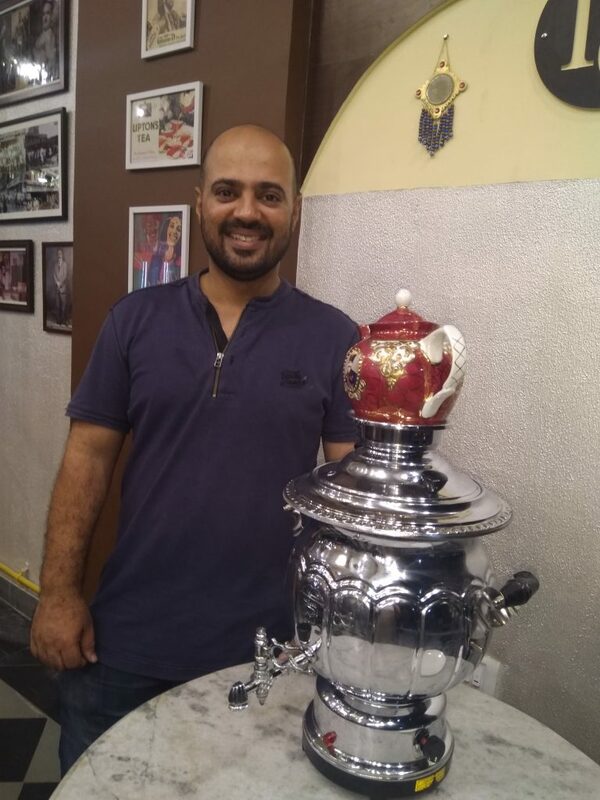 So, today when they offered to treat me to lunch there, I jumped at the offer and had a memorable time reminiscing about the old Irani Restaurants that I used to frequent. I was zapped at the entrance itself. One look at the interiors and I was back in 1958. 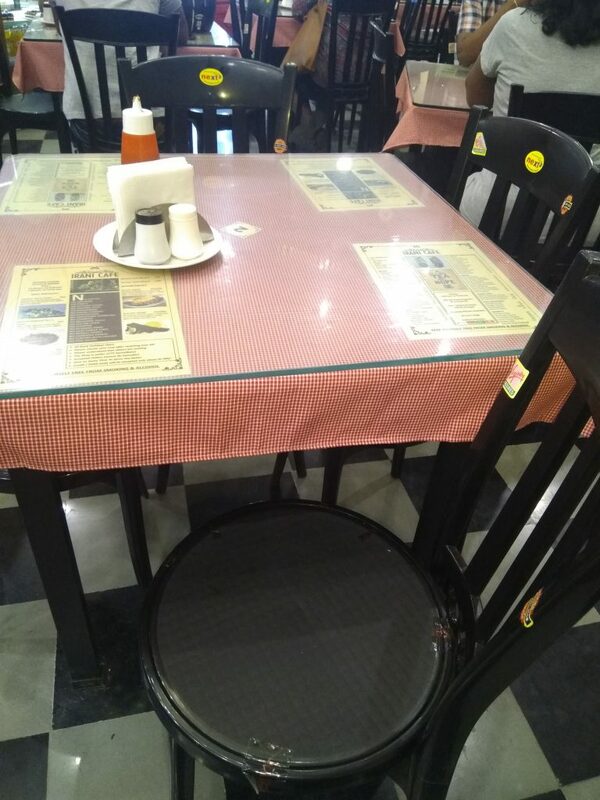 The small square tables with typical Irani Cafe Chairs, red and white gingham checked table cloth under a glass top a shelf and counter selling bakery products, soft drinks etc and the general bustle of a typical Irani Cafe. 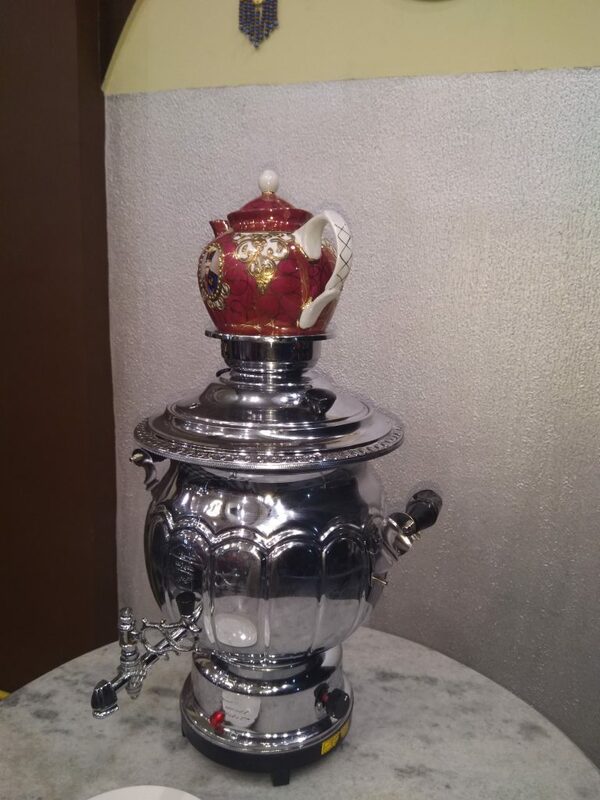 And icing on the cake was a classic samovar too at the entrance! Here are two teasers as it were, to tell something about the cafe. 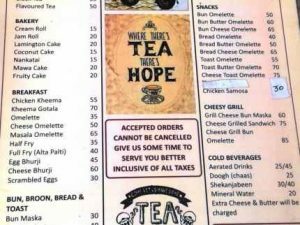 Their rules and one page of their menu. Please click on the images to get larger resolutions. Being a vegetarian, I ordered a plate of Cottage Cheese and Berry Pulao. The children had Mutton Biriyani and most of the vegetarian fare as I couldn’t have it all. 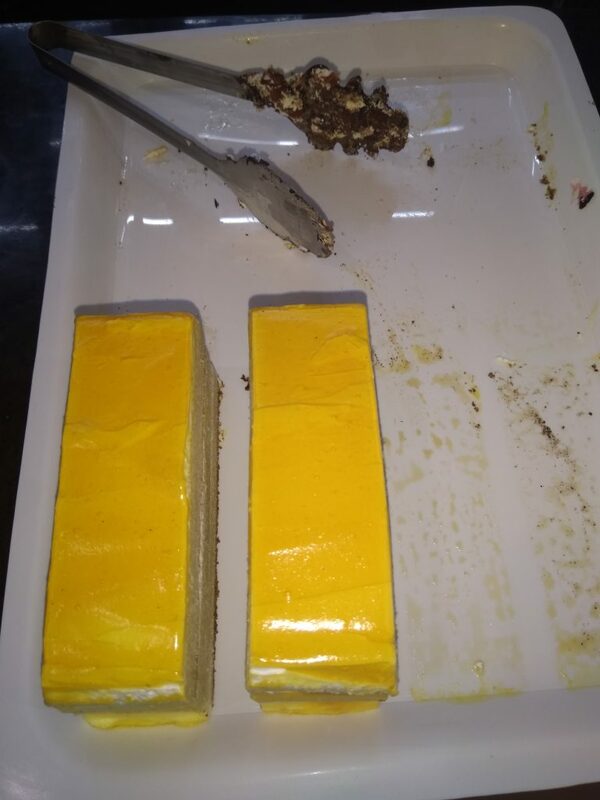 For dessert I had Black Forest Pastry and the children had Mango Cheese Cakes of different shapes with some helpings to me too. And to finish it all off for old times’ sake, I ordered for Irani Chai in a glass. And to welcome all customers with a smile and good cheer one of the partners Ameer. I had asked the other partner Mukhtar where he sourced the berries from and much to my disappointment he said that every time someone came from Iran, s/he would get berries which would then be refrigerated by them for regular use. My dear friends Sandeep and Deepali are visiting and have already decided to take me to lunch at Irani Cafe on Wednesday and I am sure that there will be many more such occasions from now on. 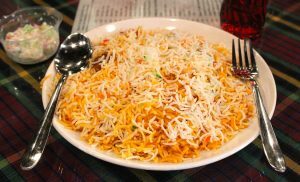 For all my friends in Pune, I recommend Irani Cafe Kalyani Nagar for great food and nostalgia. This entry was posted in Food, India, Nostalgia and tagged Bombay Bakery Hyderabad, Samovar, Wikipedia. Bookmark the permalink. 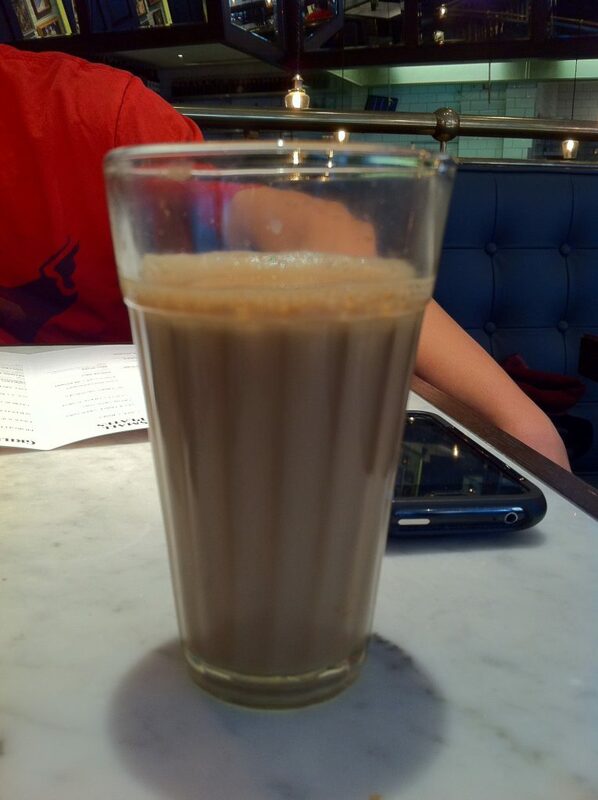 15 Responses to Food And Beverage Nostalgia Trip. My type of place, Ramana, how fortunate for you, this will be your new “pub”, LOL. I love the rules and the menu. The only difference will be that there is strictly no booze allowed there! Not that I look for it but, unlike a pub it is for a quick meal or a glass of tea with some bun or biscuits. 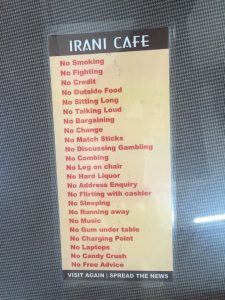 I love the list of forbidden activities – especially no flirting with cashier, no running away and no sleeping. 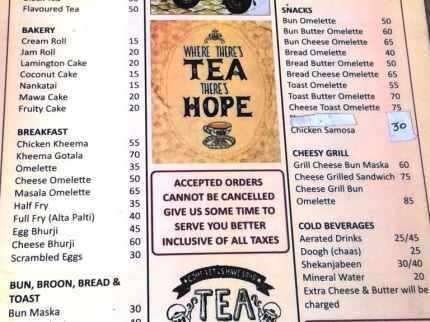 No restaurant here would get away with such a draconian list of taboos! I’ve never seen a bun omelette or a bread omelette before. Intriguing. The bun here will not be like the ones you get in the UK. This will be in the shape of a bun but will taste like ordinary white bread. Bun or bread omelette simply means an omelette served with either buttered bun or two slices of bread. a rest finally for a beloved guru! you can simply go and enjoy a wonderful meal! My blog has been appreciated by the owners and they have put a link up in their facebook. I will ask for discounts when I go there next. That actually looks very good but since it is Iranian it is probably illegal for me to eat there. I can be very stealthy for a big guy though. 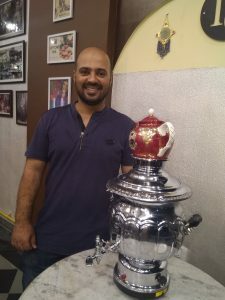 The owners are Indian citizens of Iranian descent with familial ties still in Iran. There is a sizeable population of them in India spread all over. So, you should not have any problems. Frankly, I would not advice your changing over to vegetarianism. It will be difficult for your current lifestyle. I love the rules too! That’s neat that it’s so close to you. Cheerful Monk recently posted..The Lilacs Are Happy! As I write this, I have already been there three times! how fabulous for you – and for anyone else…great about your review here, going to their f/b page! 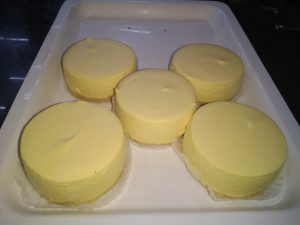 They were all agog with my blog post and were very grateful when I went yesterday and again for lunch today. Their fb page will improve with time. I like the sound of that place and I would love to see those ‘rules’ displayed in cafes and pubs (obviously not the ‘hard liquor’) across the UK… Ah! I feel a touch of the ‘nostalgias’ coming on. I can relate to your nostalgia! Perhaps the next vacation?